Ground herbs have more concentrated flavor as opposed to using whole herbs and hence you need to use in lesser quantities while cooking. To get a good quality grind that is more uniform and fine grind, you need the best herb grinder. We have made our best efforts to help you select the best product by comparing them here. What Are The Different Types That You Can Choose From? 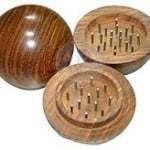 When it comes to materials, herb grinders come in wood, plastic, and aluminum. are often coated with a wood finish which can be harmful. Also, herbs tend to stick at the threads making them short-lived and hard to maintain. are often made with cheap plastic which tends to break on use, and you get bits and pieces in your ground herbs. are the most popular. Though expensive they are often the safest. 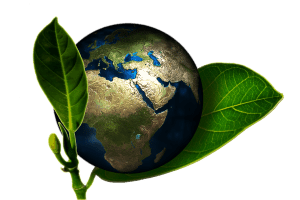 They last longer due to the higher grade of material being used. They may be a little more expensive than the other versions but most come with a lifetime warranty which makes them a worthwhile investment. You also have electric and hand crank versions. For the amount being ground at home, you don’t need an electric version, and the hand crank version has complaints about non-uniform grinding and too much of work for too little output. Grinders also come with single compartment (2 pieces), two compartments (3 pieces) and three compartments (4 pieces) versions. The 2 piece version is the simplest one with the grinding storage being done in the same compartment; however, you end up with uneven grind and big bits being stuck to the teeth. The 3 piece version allows for the ground herb to fall through a mesh to the compartment below and the bigger bits remain in the grinding compartment; so that you get an even grind. 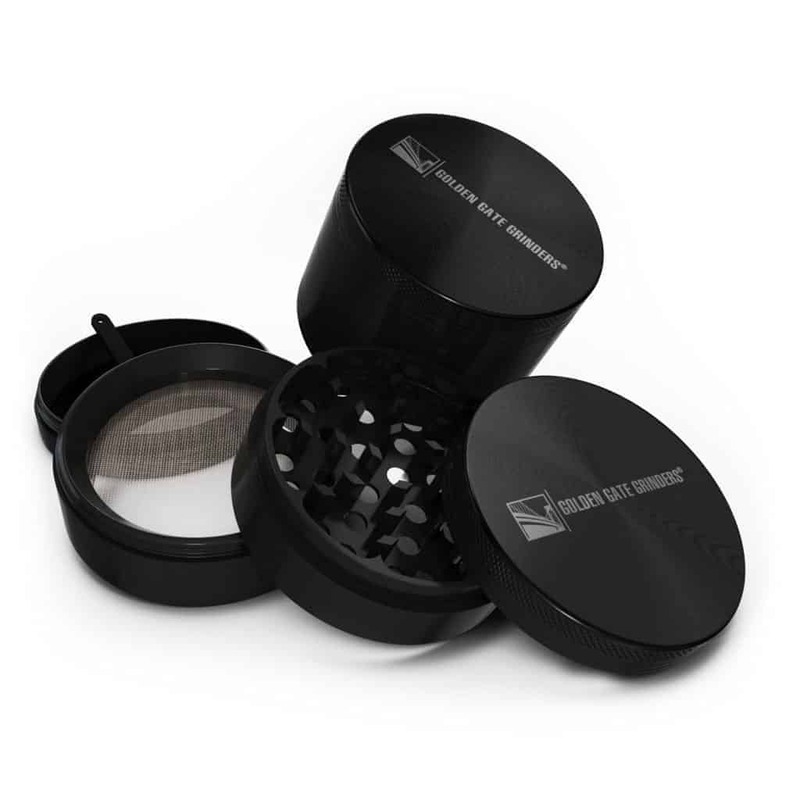 The 4 piece versions are the best as they allow an even grind and also for a fine strain of your herbs due to a mesh or a filter separating the third compartment. You have small, medium and large sizes. For most home cooks the medium size is perfect both for family cooking and for cooking when you have guests at home. With all the above information in mind, let us look at the top five herb grinders on Amazon.com to understand the product with the best value for money when it comes to medium-sized aluminum herb grinders. This grinder is made of anodized aircraft grade aluminum, which is extremely durable. It has 45 diamond shaped, CNC machined and precisely cut teeth which will finely grind the herbs without shredding it. The teeth will not wear-out or break with use. It has been precisely made using CNC machines. It has four pieces and three compartments. The fine Micron Stainless Steel Mesh will give you a fine strain of the herbs. 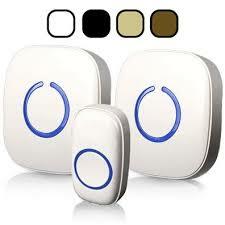 It is 2.5 inches in diameter which is a good size for home use and also for holding it comfortably. The textured edges are highly useful as they allow one to hold the grinder better. The lid is held in place during the grinding by powerful neodymium magnets. It weighs around 4.8 ounces which gives it a nice heft but does not make it too heavy. Golden Gate is manufactured in the USA. It comes with a money back, lifetime guarantee which shows the confidence the company has in its product. At this price, it is one of the most affordable grinders in the market. 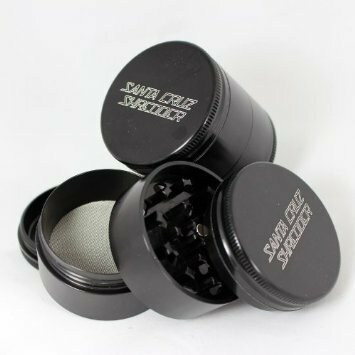 Space Case grinders have long been considered as one of the best range of herb grinders in America. They belong to the premium category of grinders with the Titanium range being one of the top ones. They are made of High-Quality Aerospace Aluminium alloy coated in Titanium (one of the strongest materials known to man). This layer of titanium makes them one of the strongest and most durable grinders in the market today. This coating also ensures that the herbs to do stick to the grinder walls and teeth. They have Teflon grade O-rings which make for smooth turning of the grinders. They have diamond shaped teeth which allow for a fine grind. They come with the best mesh on the market today. It comes with 3 compartments, i.e. in four pieces and has a 2.5-inch diameter. It also has neodymium magnets to ensure that the lid stays on during the grinding process. The titanium layer is also why it is one of the heaviest grinders weighing in at 5.6 ounces. All this quality, of course, comes at a cost. 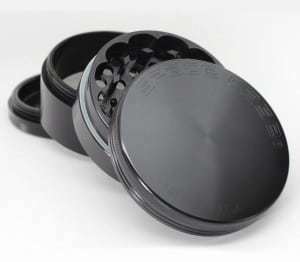 This is a cheaper version from the Space Case range of grinders. The only difference is the material with which it is made. It is made of High-Quality Aerospace Aluminium and does not have a titanium coating. It has the Teflon grade O-rings and the diamond shaped teeth of the earlier version. It also has the mesh as the one above. It is 2.5 inches in diameter and comes in 4 pieces (three compartments). Due to the change in the base material, it is lighter in weight at 4 ounces only. It is still one of the more expensive grinders but cheaper than the titanium version. Santa Cruz grinder claims to be the only grinder using medical grade materials. 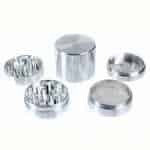 These grinders are made of Medical-Grade Anodized Aluminium and then cleaned ultrasonically with high-frequency sound waves and a medical cleanser to remove even the tiniest particle that may have been deposited during the manufacturing process. The lids are fastened using earth magnets which have a triple coating of nickel-copper-nickel for a much stronger holding. There is a ring between the two grinding layers which leads to a smoother grinding action. It has square-shaped teeth and can cut in both directions. The manufacturers claim that the design is more ergonomic making it easier for people with arthritis etc. to use it more easily. The grinder is a bit taller than other grinders in the market and has a larger sifter chamber. It is also one of the heavier grinders, 6.4 ounces. It is priced at the higher end of the price range for grinders. 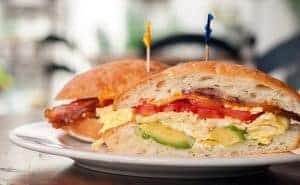 It is the cheapest grinder on the list. It comes with a money back guarantee. It is made of Aircraft grade aluminum. It has diamond shaped teeth for a smooth and even grind. It is 2.5 inches in diameter and weighs 4.2 ounces. It has a fine mesh to get smaller ground herbs. It has a clear acrylic central chamber which allows you to see the amount of ground herb. It can also be converted easily to a 3 compartment travel-friendly grinder by removing the central acrylic chamber. One of the problems noticed with this product is that the lid tends to stick as the threads have not been manufactured with precision on some of the grinders and some of the material tends to get into these spaces making the lid stick. Also, the acrylic part may crack if too much of herb is filled in. What to Expect In A Herb Grinder? The grinder needs to be made to last, with materials which will wear well and stand the rough usage it might undergo. The material also needs to be food grade so that it is not harmful to your family’s health. As with any product purchase decision, the price of the product always plays an important part. 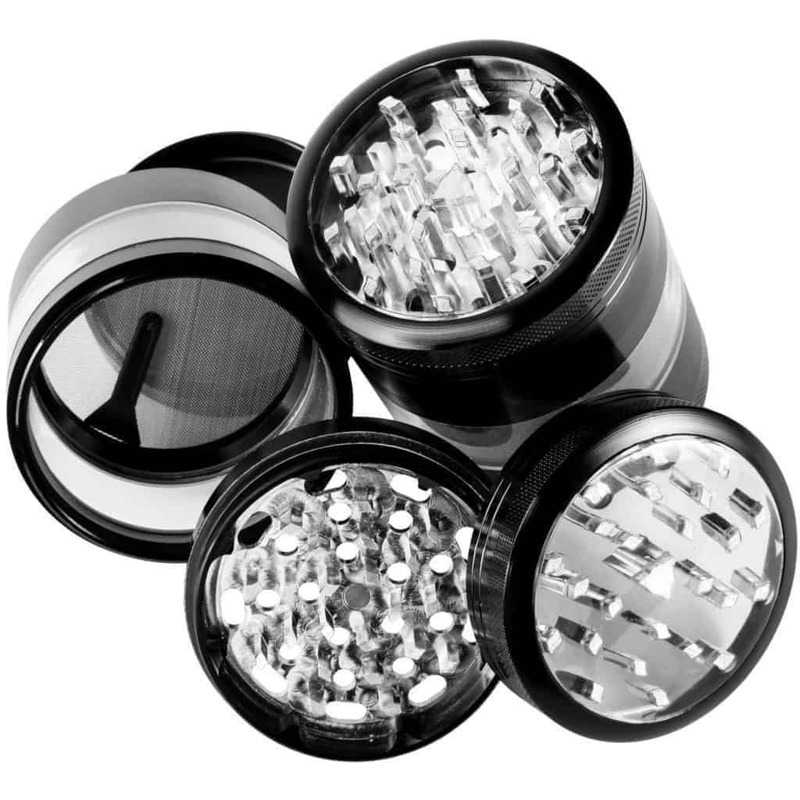 Price range for herb grinders varies from $5 to $75. Check out the Top 10 Best Smelling Laundry Detergents. It is easy to see why customers on Amazon.com have given the highest rating to the Golden Gate Herb Grinder. It is durable, comes with a lifetime warranty, provides evenly ground materials in comparison to a higher priced model, is precisely engineered and machined and most importantly is priced right for the average home consumer. This is what makes the Golden Gate the best value for money Herb Grinder. forum.grasscity.com : Things to look for when buying a grinder.